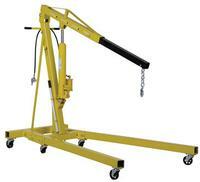 This crane allows one person to maneuver product from location to location, and then lift it with everyday factory air. 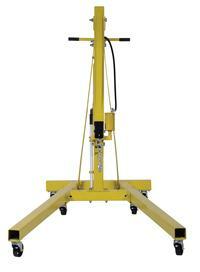 If air is temporarily unavailable, lift product with the hand pump hydraulic option. Air raises unit 7" to 8" per second. 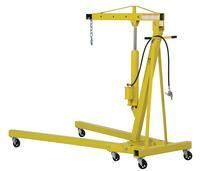 Hand pump raises units ." per stroke. Units roll on 3." x 1." cast steel casters, (4) swivel in back (2) rigid in front. 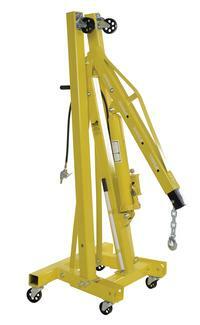 The Hoist offers heavy-duty lifting power, while optimizing space when in the folded position. 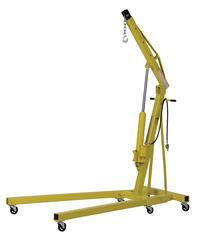 Standard features: foldable legs, adjustable boom, swivel hook, and steel construction.